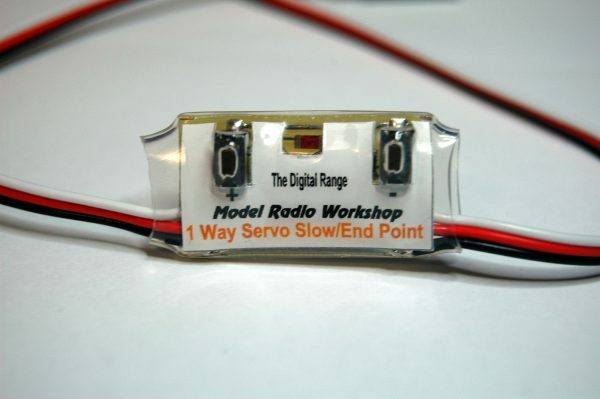 The 1 way servo slow has been designed for power boat model to slow down a servo in one direction to change the length of the tuned pipe on the engine. The slow travel direction can be selected. At start-up, servo drives at full speed to stick position. Plug the flying lead on the Servo Slow Unit into the selected channel on your receiver. Connect the servo to the Servo Slow Unit. Switch on the transmitter and then the receiver. The servo will move to the selected position at full speed. After a short delay, the movement of the transmitter stick will operate the servo at the selected speed. Before performing any set-up, if your transmitter has travel adjustment or servo reverse, set the travel to 100% and set the travel direction to normal. To toggle the servo operating direction between forward and reverse, during operation, press and hold the DEC key until the LED flashes. The servo travel direction will be toggled when the key is released. The neutral trim and end points (travel volume) are set during normal operation. To enter set-up, press and hold the INC key until the LED flashes. The LED will light continuously when the key is released to confirm that the set-up is active. The servo will follow the stick movement at full speed. Move the stick to neutral and use the INC and DEC keys to set the neutral position. If the key is pressed and released (short press) the servo will move by one step. If the key is pressed and held the movement will auto-repeat. When the neutral is correct, or if a neutral is not available, (2 position switch used for input) press and hold the INC and DEC keys simultaneously until the LED flashes. The LED will light continuously when the keys are released to confirm that set-up is still active. Move the stick to the extreme on one side of neutral and use the INC and DEC keys to set the end point position. Move the stick to the other side of neutral and use the INC and DEC keys to set the end point on that side. If the key is pressed and released (short press) the servo will move by one step. If the key is pressed and held the movement will auto-repeat. Exit the travel set-up by pressing the INC and DEC keys simultaneously until the LED flashes. When the keys are released, the LED will go out to confirm that the set-up is complete. Be sure to exit the set-up, to store the new settings, before operating the unit. The servo speed is adjusted by altering the number of delay units. As supplied, the Servo Slow Unit is set to a delay of two units. The servo will move more slowly as the delay units are increased. Please note that the servo transit time (delay) is proportional to the servo travel. Less travel gives less transit time. To set servo speed, press and hold the INC key and switch on. The LED will flash in groups of 7. Release the key when the required number of flashes have been seen. 1 flash will give full speed while 7 flashes will give the slowest speed. If you are not sure of the count, continue to hold the key and start counting again from the next pause. To enter the set-up for the servo slow action, press and hold both keys and switch the unit on. Hold the keys until the LED flashes. The LED will light continuously when the keys are released to confirm that set-up is active. The servo will follow the stick movement at a slow speed. To toggle the servo slow action between single sided and double sided, press and release the INC key (short press). When single sided servo slow is selected, to toggle the slow travel direction, press and release the DEC key (short press). The servo will immediately respond to the new selection. To exit servo slow set-up, press and hold both keys simultaneously until the LED flashes. When the keys are released, the LED will go out to confirm that the set-up is complete. Be sure to exit the set-up, to store the new settings, before operating the unit. To reset to factory default, press and hold the DEC key and switch on. Hold the key until the LED flashes. Please ensure that the set-up keys cannot be pressed accidentally while the unit is in use.